Hanko passenger and car ferry ticket prices, timetables, ticket reservations and information for ferries sailing from Hanko to Rostock. Compare all available Hanko ferry ticket prices in real time and book the cheapest available Hanko car and passenger ferry tickets sailing to and from Hanko, Rostock with Superfast Ferry Line ferries online with instant confirmation. Book Hanko Ferry Tickets with Superfast Ferry Line for ferries sailing from Hanko to Rostock online in advance to enjoy the cheapest available ferry ticket price. The price you see is the price you pay. There are no hidden extras or surprises such as added fuel surcharges or booking fees and we do not charge you anything extra for paying with a Visa Electron card. The price we quote you for your selected Hanko passenger or car ferry ticket, onboard accommodation and vehicle type is all you will pay, and that's a promise. To obtain a Hanko ferry ticket price and book your ferry ticket securely online please use the real time ferry booking form on the left. You are also able to add a hotel at your destination, or anywhere else, to your ferry ticket when completing your ferry ticket reservation. Hanko (Hangö in Swedish) is Finland's southernmost city. It is a major recreational marina with many or most sailboats and motorboats visiting Hanko on their way west towards the Finnish archipelago or eastwards to Helsinki. Hanko is a popular town to visit in summer and a lot of tourism ensures good services and a lot of restaurants in the marina. Hanko is also a major port for exports and imports year around. The Hanko Peninsula, on which the city is located, is the southernmost tip of continental Finland. The soil is a sandy moraine, and vegetation consists mainly of pine and low shrubs. Hanko is known for its beautiful archipelago. The city has a coastline of approximately 130 kilometers of which 30 km are sandy beaches. There are also over 90 small islands and islets within the city limits. The skyline of Hanko is dominated by the church and the water tower. The Hangon Regatta has been a traditional fixture on the Finnish social scene, and is the major summer event in Hanko. Sailing enthusiasts attend in order to compete, as well as mostly young people who have very little or no interest in sailing, and attend only in order to party and drink. The latter constitute the "Regatta tail", not appreciated by most of the town's residents, and which causes huge expenses for clean-up of the parks and streets. Other traditional summer activities are the "Tennis Week", the "Sea Horse" riding competitions, and the "Summer Theatre" events. Several sandy beaches and a multitude of leisure harbors attract tourists during the summer months. The emigrants' memorial statueThe site was already known by sailors in the 15th century. Petroglyphs from that time are carved into the rock at the "Hauensuoli" island. Hanko has a long history of wars and battles. The Battle of Gangut between Swedish and Russian navies was fought in 1714 in the archipelago north of the peninsula. The battle was the first-ever victory of the Russian regular fleet. The fortification works on the Hanko Peninsula had already been started by the end of the 18th century, when the Swedish constructed three separate forts on the outlying islands. The forts were later bombarded by the Royal Navy during the Crimean War and they were eventually blown up during the hostilities by their own defenders. The city was founded in 1874, soon after the Hanko-Hyvinkää railway was inaugurated in 1872. The Imperial Charter for the city was granted by Tsar Alexander II. Hanko was the port of choice for emigrants leaving Finland for a new life in North America in the late 19th and early 20th centuries. A memorial statue, showing birds in flight, commemorates this. In the late 1800s, while Finland was still a Grand Duchy under Russia, Hanko was a popular spa resort for the Russian nobility. Some of the buildings from that period survive, notably the Hanko Casino (which is not a gambling establishment, but a former banquet hall of the spa). It is nowadays a restaurant. Field Marshal C. G. Mannerheim owned a café, "Neljän Tuulen Tupa" ("The House of the Four Winds") which still is very popular among tourists and residents alike. The Bengtskär lighthouse is the highest one (52 meters) in the Nordic countries. It is situated to the south of Hanko. It was built in 1906 and it is the first lighthouse museum in Finland. A number of ferries operated up until 2006 between Hanko and Rostock in Germany. Best Price Guarantee - We always offer you our lowest available Superfast Ferry Line passenger and car ferries ticket price to and from Hanko. There are no hidden extras or surprises such as added fuel surcharges or booking fees and we also we do not charge you anything extra for paying with a Visa Electron card. The price we quote for your selected Hanko ferry ticket, onboard accommodation and vehicle type is all you will pay, and that's a promise! In the unlikely event you find the same all inclusive Hanko ferry ticket cheaper in the brochure of any other tour operator we promise that we will do our best to beat that price or offer you the choice of requesting a refund. 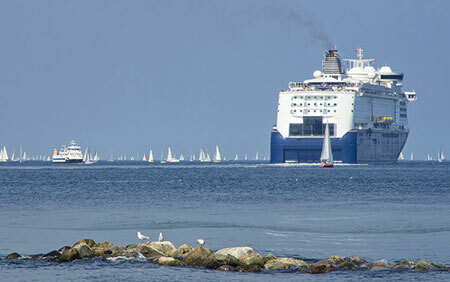 To book Hanko car and passenger ferry tickets please click here. At ferryto.co.uk you are able to obtain live Hanko ferry ticket prices, check availability and book car and passenger ferry tickets to and from Hanko at our lowest available ticket price. Ferryto.co.uk is part of the world's largest online ferry ticket distribution network providing the ability to book over 80 major European ferry operators including to Hanko and to over 1,200 other ferry routes throughout the UK, France, Spain, Ireland, Holland, Eastern Europe, the Mediterranean, the Baltic and North Africa.